The impact of immunotherapy is difficult to evaluate at the present time. Most likely, developments of greater consequence still lie in the future. In contrast, studies on the immunobiology of cancer have been more encouraging. 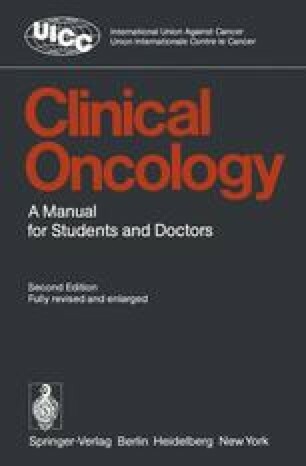 The determination of immune competence prior to and during therapy has been found to be of some prognostic value.103 Since preliminary studies have shown that the overall therapeutic effect on both the tumour response and recurrence rate may depend on both immune competence and the cytotoxic therapy, optimal therapy planning may require an evaluation of the individual patient’s immune status. Confirmation of the original results103 is currently being widely tested in many laboratories. It is anticipated that routine laboratory test systems will be developed that permit a prognostic correlation between cell-mediated immune responses and the result of therapy.